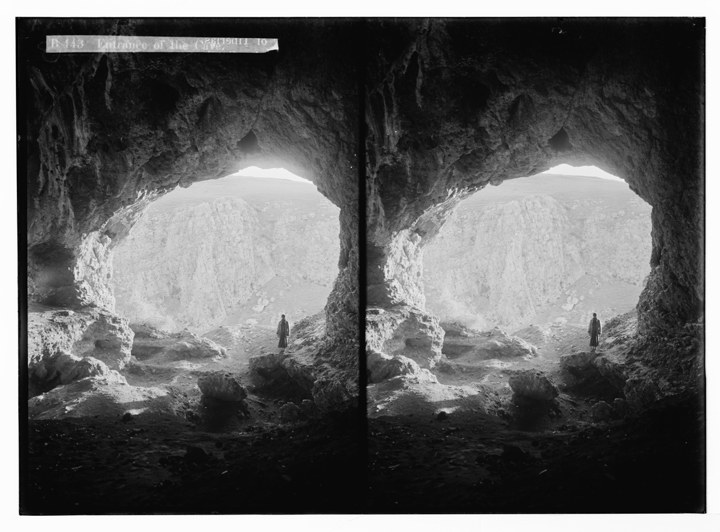 Cave of the prehistoric “Galilee Skull,” approximately 1900–1920, by American Colony (Jerusalem) Photo Department. G. Eric and Edith Matson Photograph Collection, Library of Congress. When I was seventeen and applying to university, I told my teachers that I wanted to study philosophy. They did not show much enthusiasm for my choice of subject. This was an Orthodox Jewish school in northwest London, and philosophy, an intellectual tradition whose very name stamps it as Greek, was hardly the flavor of the month—or the millennium. And yet I took to Plato like a herring to water. Why? There is no denying the disparities between Greek and Hebrew styles of thinking, and you might have thought that reason and revelation are ultimately mutually exclusive. So, how come I, a nice Jewish boy with an Orthodox education from age five to eighteen, felt at home with the apikoroi? And not me alone: lots of other nice Jewish girls and boys, without turning their backs on Judaism, have had a similar experience. How come? Light can be shed on this question by juxtaposing two famous passages from the two bodies of literature that seem, at first, so opposed: the drama of the Decalogue in Moses’s Exodus and the allegory of the cave in Plato’s Republic. Both are defining moments, the one for Hebrew scripture and the other for Greek philosophy. And I find between them a striking affinity. This perception is liable to seem improbable. From the Children of Israel camped at the base of Mount Sinai to the troglodytes dwelling under Mount Olympus (where I imagine Plato’s cave to be located) is quite a leap; it is certainly a reach. So, I should clarify in advance what I am—and am not—setting out to do. First, this essay is no more than an attempt at an adumbration of a nascent idea. Second, I am granting myself philosophical license and not trying, in the manner of a scholar, to be true to the intention—whatever that might mean—of the original texts. Consequently, and third, I am open to the objection that affinity is in the eye of the beholder. Could it be that looking makes it so? I do not think it is so simple. Yet in the end the form of argument I am making goes something like this: “This is how it strikes me. Does it not strike you the same way?” I have nothing else to offer than a way of looking. 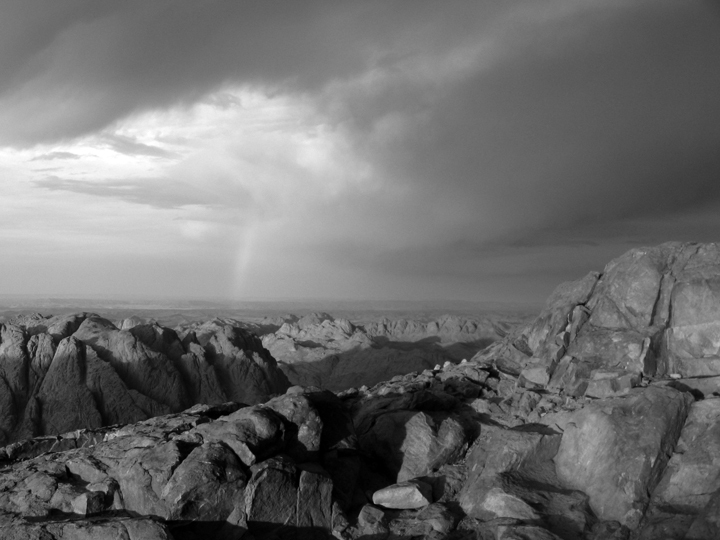 Mount Sinai, 2006, by Wikimedia Commons user Cirodite. Fourth, what I am not doing is this: interpreting Exodus in the light of the Republic, nor vice versa. I am not following in the footsteps of Philo (the man who has been called “the first Jewish philosopher”), wearing one Hebrew sandal and one Greek, seeking to synthesize the passages that I am comparing. I am merely setting them side by side, letting them keep their distance from each other, allowing them to speak their own language, and listening for resonances that seem to bear on my question. The Alexandrian saw Moses in the role of the philosopher-king of Plato’s Republic. I cannot say that I am quite able to see Moses in this light. Philosophy, I feel sure, would have been Greek to him. My Moses is nonphilosophical, my Plato nonprophetic. I am not sure that either speaks to the other. But each speaks to me. Consider these symmetries. Both passages begin with a state of captivity: Exodus is about an enslaved people, Israel, while the people in the Republic passage (who Socrates says are “like us”) are imprisoned in a cave, in thrall to the images on the wall. Both passages are narratives of ascent and descent. In the one case there is the prophet Moses, who, alone among the people of Israel, makes the trek up the mountain and down. In the other case there is the philosopher, who is given no name in the text, who is not even called “philosopher,” but who clearly represents the Socratic lover of wisdom and who is able to negotiate “the rough steep path” that leads up, up, and away from the cave, into the light of day, where the sun (the Idea of the Good) beams down from an azure sky. Which is not, I admit, what conditions are like on Sinai, where the weather is terrible. There is “thunder and lightning and a dense cloud upon the mountain” (Exod. 19:16). The disparity between the two scenes could hardly be greater; which might seem to rule out my interpretation before it has got off the ground (so to speak). But although the conditions are so different, their effect is the same: in both cases those below are in the dark about what is transpiring above. Just as the dwellers in the cave are shut in, the Children of Israel are shut out. And just as the philosopher completes a lonely ascent and, out of sight from below, confronts “the sun” and extracts a logos (account) of the Good, so the solitary Moses climbs to the summit and, out of view of the base, encounters Hashem (“the name,” Exod. 6:3) and obtains the aseres ha-dvarim: the ten words on how to live. Both bring the word down from on high. Evidently, the people do hear the voice of Hashem speaking from within the cloud (Exod. 19:9). But do they get it? Do they, to put it differently, hear it? A familiar theme in prophetic literature (beginning with Moses) is that the people have eyes but do not see and ears but do not hear (Deut. 29:3). And a constant prompt that the prophets use (again Moses starts the trend) is “Hear, O Israel!”—as though the people don’t. When the voice of Hashem emanates from the cloud, what do they hear? An articulate sound. It makes a great impression. But, in effect, they do not hear a word. We gather this from the fact that they proceed at once to make an image, the molten calf of gold. The moment that Moses disappears from view and the impression made by the voice of Hashem fades away, they look for a replacement, a new image that substitutes for the one they have lost, an image that endures rather than the evanescent word. Earlier they said, “All that the Lord has spoken we will do!” (Exod. 19:8). Now they are manufacturing a golden calf, which expressly contradicts the word that Hashem spoke in their hearing. But from their point of view, there is no contradiction. Their behavior is consistent according to some such principle as this: “Always worship and obey that which impresses you most in the moment.” This is the rule of the image. Roughly, it is the opposite of the rule of the word. And the contradiction is deeper than the infringement of a single clause in the pact between Hashem and the people. The worship of an image contradicts the whole sense of a god who, fundamentally, from day one, speaks. Not being an image, the word Hashem speaks cannot be taken in at a glance. To grasp it is to engage with it, to wrestle with its meaning as if with an angel, never letting go but never pinning it down: perpetually a defining moment. The word of Hashem is inherently fecund; it is a word that begets more words that beget still more. The begetting is the getting: to get it is to feel that you have not quite got it, not ever, like a permanent itch you can never scratch enough, so that you keep on scratching, keep on defining. A divine word—a word we attribute to heaven—always calls for discussion. To discuss it is to hear it: this is the rule of the word. If it ceases to summon discussion it degrades into image: it no longer is a word—though it might look like one. No word that falls into human hands is immune from this risk. The word become image: this is the state of religion when it has degraded into fundamentalism. The people of the book are subject to the rule of the word. So is the philosopher, whose logos of the Good is never definitive. It always calls for more argument; which is why, differences notwithstanding, some of us feel at home among the Greeks. Brian Klug is senior research fellow in Philosophy at St. Benet’s Hall, Oxford. His most recent book is Being Jewish and Doing Justice: Bringing Argument to Life (Vallentine Mitchell, 2011).